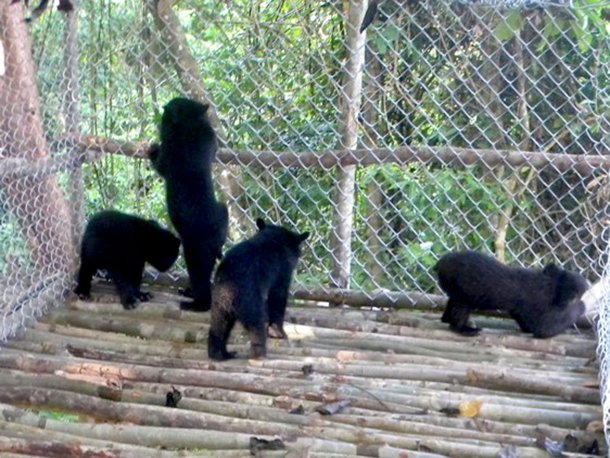 This first-person account of moving four Asiatic black bear cubs from the IFAW-WTI Centre for Bear Rehabilitation and Conservation to their acclimatization site comes from Dr. Jahan Ahmed. There is no greater feeling than being part of the process of rehabilitating rescued animals back into the wild. And, yes I was overjoyed when recently the IFAW-WTI team, of which I was part of, shifted four hand-raised bear cubs from the Centre for Bear Rehabilitation and Conservation (CBRC) to Doigurung in Pakke Tiger Reserve, Arunachal Pradesh, for the soft release process. On October 22, 2015, the bears were shifted for acclimatisation at Doigurung wherein IFAW-WTI animal keepers would take these young bears for a walk into the wild to get them used to the ways of jungle. It all started on October 20, 2015, when the team decided to move the bears from CBRC to Doigurung which had been zeroed down as the spot for soft release after a lot of deliberations amongst the IFAW-WTI team and the Arunachal Pradesh Forest Department. Early in the morning, the young bears were moved to two separate customised wooden boxes with a single mesh. To reach the site was by no means an easy feat, considering that the trip would require two days of non-stop travel. We left the CBRC facility in the MVS vehicle for Khari in the wee hours of October 22. On reaching Khari, we were introduced to two mahouts employed with the Arunachal Forest Department who were to take us to the site where these cubs would finally be released. I led the team which included four animal keepers and two mahouts. It was a hot and humid day making the travel unpleasant but we had to go on. Even the bear cubs were exhausted at the end of this long road to freedom; we were monitoring them every two hours to ensure their well-being. On reaching the acclimatisation site at Doigurung, the four bears were kept in a single enclosure under the observation of three animal keepers for 24/7 monitoring. It was heartening to see these bears return to the wild where they would spend the rest of their lives. Rescued from different parts of northeast India, primarily Arunachal Pradesh and Assam, these bears – two males and two females-- were hand raised by the CBRC team. Moreover, in the next phase, CBRC team would shift two more bears at the acclimatisation site in Doigurung. They would be kept at the acclimatisation site for almost six months wherein the animal keepers would act as foster mothers and take these cubs for long walks into the forest to let their natural instincts take over before being released into the wild. The beginning of this soft release process of six bear cubs has added yet another feather in the bear conservation efforts of IFAW-WTI which will go a long way in the survival of this beautiful species. I will continue to move through these treacherous terrains braving adverse weather conditions to ensure that these animals go where they belong.